Do you have a child who loves baseball? If so, taking in a local minor league baseball game is an affordable option for the entire family. It's a good day trip activity. Minor league baseball games are held in family friendly stadiums and are great for everyone, from grandma and grandpa, mom and dad, to all the kids. Because you get to see most of the baseball action up close, watching a live minor league game is great fun and best of all, it doesn't break the family budget. Most game tickets cost anywhere from $9 on up. As a fan, you can almost reach out and touch the baseball players in the infield. Kids of all ages will delight in seeing line drives, spectacular catches, great pitching, close outs and maybe even some fantastic home runs. Wouldn't it be great to catch and take home a souvenir foul ball? Also, think of all the great treats you can eat - hotdogs, popcorn, peanuts, cracker jacks, ice cream and cotton candy. Any kid would love that! Brooklyn Cyclones play minor league baseball at MCU Park in Brooklyn New York with Coney Island's Rollercoaster as a backdrop. This unique ballpark is a great experience for kids and adults alike. 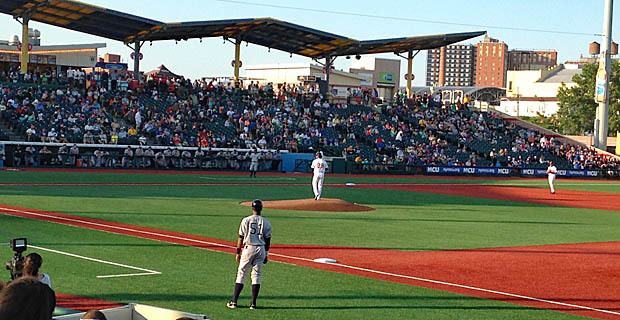 MCU Park is family friendly and ticket prices are economical, making it a great day trip for the whole family. Look for statues of Jackie Robinson and Pee Wee Reese at the entrance to MCU Park. Coney Island beach and various boardwalk attractions are nearby. Hidden Gem: Every Home Game is Family Sunday - for $20 you get a ticket, T-Shirt and Food. Now, that's hard to beat! 1904 Surf Avenue, Brooklyn NY. Tel: 718-37-BKLYN. Harrisburg Senators is a minor league baseball team playing at FNB Field in Harrisburg PA. Over 70 day and night games to choose from. Good side trip if you are visiting the Hershey Park area. Wonderful kids zone area with tons of inflatables to play and jump around on. 245 Championship Way, Harrisburg, PA. Tel: 717-231-4444. Lakewood BlueClaws are a minor league baseball affiliate of the Philadelphia Phillies. They play at FirstEnergy Park, a stadium which can seat over 6,500 fans. Doctor Bernard's Kid Zone in left field features inflatable slides, obstacle courses, a bounce house, fun and games. Bring the family and enjoy a day at the ballpark! 2 Stadium Way, Lakewood, NJ. Tel: 732-901-7000. New Jersey Jackals are a minor league baseball team and they play at Yogi Berra Stadium, located on the campus of Montclair State University in New Jersey. Picnic and Kids Zone area are located by right field. Fun fact: all the field dimensions end in the number 8 to honor Yankee Yogi Berra's uniform number. Have a day trip outing - experience a baseball game and a visit to the Yogi Berra Museum and Learning Center all on the same day. 8 Yogi Berra Stadium, Little Falls, NJ. Tel: 973-746-7434. Reading Fightin Phils are a AA affiliate of the Philadelphia Phillies. Based out of FirstEnergy Stadium in Reading PA, kids and adults alike can enjoy an awesome baseball game. Admission tickets are affordable. Wonderful family experience. 1900 Centre Avenue / Route 61 South, Reading, PA. Tel: 610-375-8469. Scranton Wilkes-Barre RailRiders are a AAA affiliate of the New York Yankees playing at PNC Field in Moosic, PA. Great for kids to watch a baseball game here and learn more about the sport. 235 Montage Mountain Rd, Moosic, PA. Tel: 570-969-2255. Somerset Patriots are a minor league baseball team located in Bridgewater in Central New Jersey. They play at TD Bank Ballpark, a fantastic minor league ballpark that holds up to 6,100 fans. Great family destination and super kid friendly. Up to 70 day and night Patriots home games played each season. Plenty of opportunity for any baseball fan to sit back, relax and enjoy a great game. The Somerset Patriots host all sorts of special nights, ranging from teachers night, scout group nights, youth baseball teams nights and various other themes. Fireworks are a big draw and part of what makes TD Bank Ballpark so special. This 2017 year will feature 20 spectacular Fireworks Nights - sure to delight all fans. 1 Patriots Park, Bridgewater, NJ. Tel: 908-252-0700. Sussex County Minors are a professional baseball team that plays at Skylands Stadium in Northern New Jersey. Over 4,200 fans can enjoy a super exciting day at the ballpark. Extremely kid friendly. Skylands boasts The Backyard Place - featuring a train, gemstone area, bounce house and carnival games. 94 Champonship Place, Augusta, NJ. Tel: 973-383-7644. Trenton Thunder is a minor league AA baseball team affiliate of the New York Yankees and they play at the Arm & Hammer Park in Trenton NJ. Watch a baseball game in a family friendly atmosphere with views of the Delaware River. Great side trip if you visiting the New Jersey's state capital of Trenton. Perfect family day trip activity, whether you live in New Jersey or the surrounding Pennsylvania area. 20 plus nights with post-game Fireworks show. Family Fun Zone located behind right field. Wonderful experience for kids of all ages! One Thunder Road, Trenton, NJ. Tel: 609-394-3300.